I love chicken wings. The deep fried crispy skin and hot and spicy buttery sauce make chicken wings so addictive and delicious. 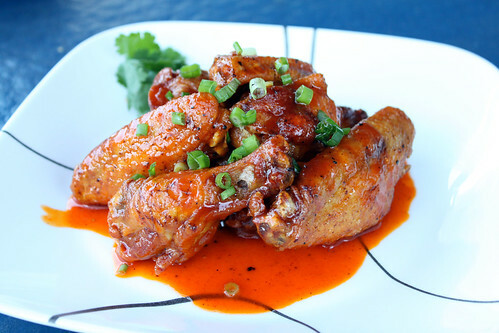 Buffalo Wing sauce is traditionally made with a Cayenne Pepper Hot Sauce and butter mixture, but I’ve always thought about making my own Buffalo Wing sauce using Sriracha Hot Sauce. While I was at the grocery store, I saw good price on chicken wings and decided to go home and play with the recipe. While mixing in the Sriracha Hot Sauce to the melted butter in the saucepan, I was thinking about what I can add to the sauce to balance the spiciness of the Sriracha Hot Sauce. I decided to add some Honey to it to balance out the flavors. Initially I thought that the honey made the sauce a little too sweet for my taste, but since Jane and my sister in law loved it so much, I think this was a quite successful dish. Note: If you want the wing sauce to be hotter, add more Sriracha. If you want it to be less sweet, add less honey. Put Chicken Wings in a bowl and mix 1-2 teaspoons salt and 1 teaspoon pepper and set aside. When deep fryer is ready, fry 6 wings at a time for approximately 8-10 minutes or until wings are crispy and golden. 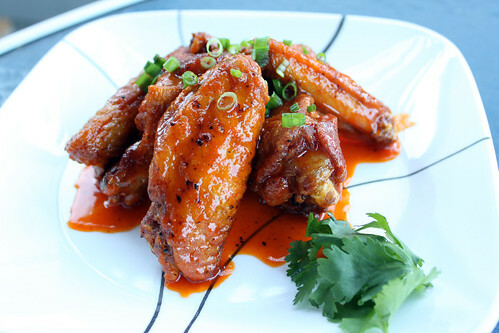 Put Chicken Wings in a mixing bowl and add a few teaspoons of wing sauce until wings are evenly coated. Shake the wings in the sauce and plate.